Welcome to the “sailing Hellas” world. 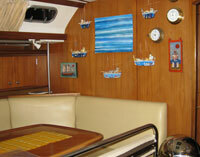 We are a small charter company, so small that we have only two sailing boats. We love the sea and the journeys and through this love we found (came to) the beautiful world of sailing. And we are very happy that we made our “hobby”, our “work”. If you ask us if this is our business or pleasure, the answer would be very difficult. Uppermost in our minds is to share the pleasure we get from it with our friends, you. The advantage rending a boat with the owner-skipper, is first of all that he knows the boat inside out, and that he is the only responsible for the boat during your trip, leaving you more time to relax and enjoy your vacations. whether you are an experienced sailor or a complete novice, he will let you involve your selves with the boat, as much as you wish. He is also there to provide you with local knowledge about the islands, the best bays to visit, the best places to shop and the best restaurants. He is very district, and the only thing he wants, is that you feel like home. For him you will be a person with your name and not a contract number. We often sail with our families and with children aboard, and the excellent condition and the safety of the boat, through the monthly check and the yearly detailed maintenance is very important to us.